The 1920s was a miraculous golden age for Soviet cinema, both for features and documentary. 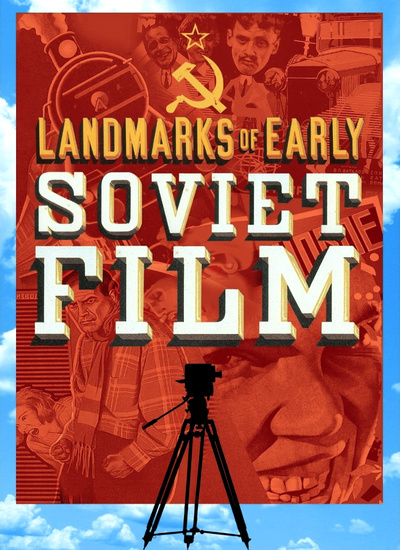 The eight films included in this meticulously curated and handsomely presented collection convey the incredible excitement filmmakers felt at the opportunity to participate in the construction of the world’s first socialist state. Freed from the need to make money that drove the Hollywood industry, they could focus on “educating” the new Soviet population. Even Vladimir Ilych Lenin, the father of the 1917 Bolshevik Revolution and the first leader of the country that would become the U.S.S.R., understood that cinema, an art based on technology and machines, was the most suitable one for a country founded on the transformation of humanity through industry and technology. Cinema was nothing less than “the most important art,” Lenin famously declared. Experimentation was the order of the decade. The set consists of eight movies, four fiction and four documentaries from the very best Soviet filmmakers. Each has a nifty new musical score, using both previously composed and original material. All the films have original Russian intertitles with English subtitles (which are removable on four of the films), except Turksib and The Fall of the Romanov Dynasty, which have full-screen English intertitles. The films of Eisenstein and Kuleshov are the best-known. In Old and New, completed in 1929 with his trusty codirector Grigori Aleksandrov, Eisenstein (1898-1948) was responding to the Communist Party’s appeal to artists in all media to create work that addressed the transformation of the backward Russian countryside. The dominant theme (as in so many other Soviet films of the late 1920s) is the triumph of the machine over outdated traditional methods. Like Eisenstein, Lev Kuleshov (1899-1970) not only made films, but also wrote extensively on film theory. His imaginative parody The Extraordinary Adventures of Mr.West in the Land of the Bolsheviks (1924) upends negative Western preconceptions about Russians and Bolsheviks, even as it consciously imitates the style of the American action films he so admired. With an all-star cast that includes the manic, leering Aleksandra Khokhlova and cameo appearances by two directors (Boris Barnet and Vsevolod Pudovkin), Mr.West reaches its Buster-Keaton-like climax in a memorable chase sequence. By the time he made By the Law two years later, in 1926, Kuleshov’s style had dramatically changed, becoming less artificial and more moody and psychological under the influence of German expressionism. This gloomy story (adapted from a short story by Jack London) of murderous jealousy and passion among three prospectors under extreme pressure in the Klondike packs considerable emotional power, with another hyperkinetic performance from Khokhlova. Future director Boris Barnet (1902-65) began as a Kuleshov protege, but they parted ways after Barnet nearly killed himself doing a stunt in the role of the cowboy in Mr.West. Soon he had a successful career as a director in his own right. Barnet’s fourth film, The House on Trubnaya (1928), a witty social satire on life under the limited capitalism allowed by the New Economic Policy, made him famous abroad as well. Written by a stellar quintet that included the formalist critic Viktor Shklovsky, The House on Trubnaya deals with one of the favorite topics of the era: the Moscow housing shortage. As thousands of peasants flooded into the capital, they resorted to all sorts of ruses to find a place to live, crowding into communal apartments that provided ample material for domestic comedy. Esfir Shub (1894-1959), one of the few female directors in the early Soviet film industry, had a less “activist” view of documentary than Vertov. Her masterpiece, The Fall of the Romanov Dynasty (1927), is a “montage of historical documents” that she found in newsreels, official film records, and home movies of the Tsar’s family. For Shub, montage meant allowing the original footage to speak for itself without excessive formal manipulation. Because the footage she discovered is so emotionally revealing, exposing the amazing indifference of the Russian aristocracy to the squalor that surrounded them during the horrific slaughter of World War I, what emerges is a powerful documentation of “living reality,” as fellow director Vsevolod Pudovkin described it. Vertov and Shub paved the way for the work of two other directors who took documentary in a more artistic, impressionistic, and even ethnographic direction: Viktor Turin and Mikhail Kalatozov. Both explored the remote and exotic territories on the southern fringe of the newly formed U.S.S.R., in documentaries produced outside the mainstream Russian studios. Both also celebrate the progressive mission of the Soviet government in bringing technological improvements to the lives of people whose lives had been virtually untouched by modern civilization. In Turksib (1929), made by Vostok-Kino in Alma-Ata, Kazakhstan, Turin chronicles the construction of a new railroad linking the textile industry of southern Siberia with the wool and cotton producing regions of Kazakhstan. His treatment of the harsh beauty of the Kazakh steppe is breathtaking, its endless sandy expanses sculpted by the wind into weird abstract patterns. The setting for what may be the most remarkable film in this set, Kalatozov’s Salt for Svanetia (1930), is an isolated village high in the Caucasus Mountains of Georgia. Made by the Georgian state studio with Kalatozov as cameraman, it bears an introductory quotation from Lenin: “The Soviet Union is a country so big and diverse that every kind of social and economic way of life is to be found within it.” So Kalatozov (who was himself of Georgian origin) spends most of his time showing the bizarre, vivid world of the Svan community, living a highly ritualized and brutal existence to which the cinematography lends a mythological dimension.